Definition at line 256 of file app-layer-dnp3.h. Definition at line 258 of file app-layer-dnp3.h. Definition at line 260 of file app-layer-dnp3.h. Definition at line 262 of file app-layer-dnp3.h. Request buffer for buffering incomplete request PDUs received over TCP. Definition at line 264 of file app-layer-dnp3.h. 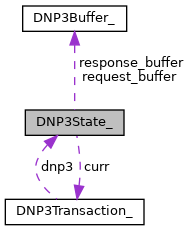 Response buffer for buffering incomplete response PDUs received over TCP. Definition at line 267 of file app-layer-dnp3.h. Definition at line 259 of file app-layer-dnp3.h. Definition at line 261 of file app-layer-dnp3.h.